which is the general expression for the gravitational potential generated outside an axially symmetric mass distribution. 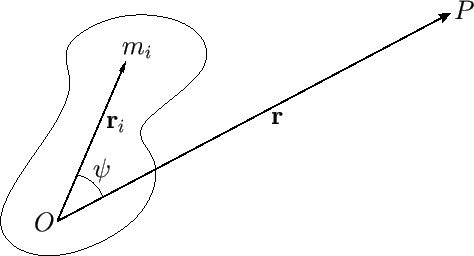 The first term on the right-hand side is the monopole gravitational potential that would be generated if all of the mass in the distribution were concentrated at its center of mass, whereas the second term is the quadrupole potential generated by any deviation from spherical symmetry in the distribution. Equation (8.69) actually holds for any axially symmetric mass distribution, not just a spheroidal mass distribution of uniform density (this is discussed in the following). Figure 8.3: A general mass distribution. where is the mean radius of the distribution, and the dimensionless parameter characterizes the quadrupole gravitational field external to the distribution.